Ion generators, also called ionizers, applied in indoor air quality products, have been marketed to homeowners for decades. The technology is relatively simple, with a high-voltage wire or brush used to electrically charge air molecules, resulting in airborne negative (and some positive) ions. The airborne ions are attracted to other airborne particles (agglomeration) and, depending on their mass (weight) will make their way to the next surface they encounter. If the charged particle is heavy enough it may collect on the air handler blower or internal coils, or the supply ductwork or registers. If the charged particles are light enough to remain suspended in the airstream for a time, they will continue to attract other particles until they eventually collide with or be attracted to surfaces in the rooms they enter. Recent studies have shown that airborne particulates, pathogens and VOCs can cause significant health problems. It’s not just the relatively large airborne allergens that cause health issues, but the much smaller contaminants that are breathed deep into the lungs and absorbed into the bloodstream that can contribute to or cause far more serious problems. So, to the degree that ionizers can and will remove any smaller contaminants from the air in an occupied space there could be a health benefit to the occupants. First, while ionizers create charged particles, but they do not have a collector for the “dirt” that is produced. The ionizer strategy stops with the charging and agglomeration steps and abandons the importance of collecting them before they enter the occupied space. The result is that the HVAC equipment, the ductwork, the registers, the room’s floor, walls, ceiling, furniture, even the food on your table become the collector. Secondly, the electrical charge needed to create ions requires a voltage high enough that will create a corona field. Once corona is established then ozone is created. If you’ve been following this series of articles then you now know that EPA, ASHRAE and the American Lung Association all suggest a zero tolerance of any amount of ozone being added to the living space. A corona discharge is an electrical discharge brought on by the ionization of a fluid such as air surrounding a conductor that is electrically charged. A corona will occur when the strength of the electric field (potential gradient) around a conductor is high enough to form a conductive region, but not high enough to cause electrical breakdown or arcing to nearby objects. It is often seen as a bluish (or other color) glow in the air adjacent to pointed metal conductors carrying high voltages and emits light by the same property as a gas discharge lamp. In air, coronas generate gases such as ozone (03) and nitric oxide (NO), and in in turn nitrogen dioxide (NO2), and thus nitric acid (HN03) if water vapor is present. These gases are corrosive and can degrade and embrittle nearby materials and are also toxic to people and the environment. Will it remove particles from the occupied space? Will it remove all contaminants, including the smallest particles, pathogens and VOCs? Will it kill pathogens and prevent their reproduction? Will it produce any byproducts that are harmful to the occupant’s health? Will it negatively impact the performance of the HVAC equipment or air distribution system? Ion generators will cause airborne particles to attract themselves to each other and grow in size and weight until they fall to the living space’s surfaces or attach themselves to any surface in the HVAC system or into the living space. Ionizers will reduce airborne particulates, but will not reduce VOCs. 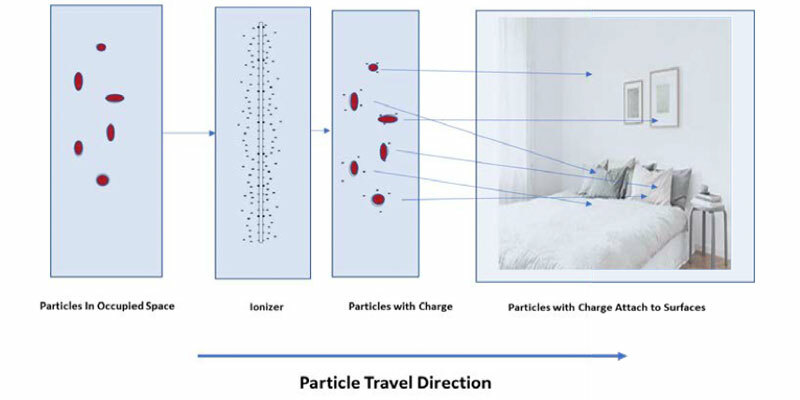 Ionizers are not proven to kill airborne pathogens nor pathogens residing in the occupied space. Ionizers that use a corona-generating technology will produce ozone, known to be harmful to the occupant’s health, and may produce additional harmful byproducts. Ionizers will not add any additional resistance to airflow that might otherwise be detrimental to the HVAC system’s performance or longevity.